Royal Caribbean has revealed on Twitter that their third Oasis-class vessel due to launch in April 2016 will be called Harmony of the Seas. Drum roll please…Royal Caribbean's newest ship to be named #HarmonyoftheSeas. More details to follow soon! Despite being an Oasis-class vessel Harmony of the Seas will be 2.15 metres longer and 5.5 metres wider than Allure of the Seas. The gross tonnage of Harmony of the Seas will be 2,418 gross tons greater than Allure of the Seas securing the title of the world’s largest passenger cruise ship. She will have 16 passenger decks and will carry 5,479 guests at double occupancy across 2,747 staterooms. The Oasis class of ships feature Royal Caribbean’s exclusive seven neighbourhood concept, including Central Park, Boardwalk, the Royal Promenade, the Pool and Sports Zone, Vitality at Sea Spa and Fitness Centre, Entertainment Place and Youth Zone. Several new renderings have been released, highlighting the fact that Harmony of the Seas will be the first Royal Caribbean cruise ship to be fitted with three water slides. 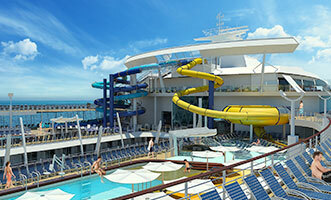 Water slides already are a popular fixture on-board certain vessels belonging to other cruise lines including Carnival Cruise Lines, Norwegian Cruise Line, Disney Cruise Line and MSC Cruises vessels. Two slides appear to be traditional water slides with the third resembling a bowl-slide. As a step up from the Oasis-class ships Harmony of the Seas will feature a new Bionic Bar on the Royal Promenade. The Bionic Bar was first introduced aboard Quantum of the Seas, and features robot bartenders serving up one-of-a-kind crafted cocktails. Additionally, guests on board Harmony of the Seas will enjoy RFID technology with Royal WOWBands that provide access to their staterooms as well as allow them to make on board purchases and reservations. Harmony of the seas will boast the fastest Internet connection at sea where guests can stream video, Skype with family and friends back at home and share their holiday photos on social media instantly. Interior cabins will be fitted-out with Royal Caribbean’s exclusive Virtual Balconies, offering an ocean view in every stateroom. Studio staterooms will be added and suite guests will also have exclusive new areas to enjoy, from a well-appointed suite lounge and a private suites-only restaurant called Coastal Kitchen to an exclusive full-service Suite Sun Zone sun deck. The iconic hand-crafted carousel will be housed on-board as well as a new classic games arcade on the ship’s Boardwalk neighbourhood, with the Starbucks café being relocated to the Boardwalk. A new climbing play area for children will be added too. Harmony of the Seas will operate the same Dynamic Dining system as found on their Quantum-class vessels allowing guests to choose when and where to dine. The new “Classic” option will also be available. Several new speciality restaurants will be added including Izumi Hibachi & Sushi, with a new teppanyaki menu, Sabor Modern Mexican restaurant and Wonderland Imaginative Cuisine restaurant. The Royal Caribbean 2016/17 itineraries have yet to be announced and these are expected to be revealed next month. 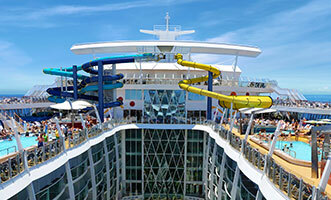 UPDATE: The Harmony of the Seas itineraries have now been announced.